It gives me no pleasure to address this letter to you. In fact I am deeply grieved to think that you as a personal friend of mine over many years should find your self in your present position. I do have a responsibility, however, which I'm sure you recognize, to place certain matters before you, so that I can convey your response to the Avondale Board and Di vision Committee. Since your lecture to the Forum at PUC in October, 1979, in which it was considered you took issue with certain fundamental beliefs of the church, you have been given more than six months to prepare a carefully documented statement of your present doctrinal position. This manuscript in which you deal with vital areas of the sanctuary truth, the role of Ellen White, and related areas has now been completed. 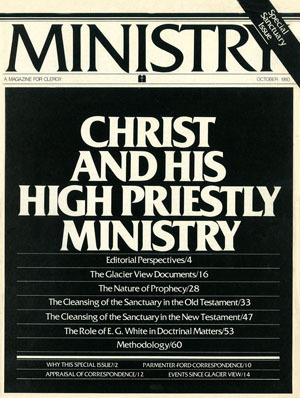 You, of course, are aware that a specially appointed committee of 120 people representing Bible scholars, educators, pas tors, administrators, and representatives from the world church met at Glacier View Camp in Colorado August 10-15, 1980, to study and evaluate your doctrinal position as revealed in the above document. At this meeting you were given opportunity to make statements and respond to questions. You are now aware that the above committee has reached a consensus ex pressing confidence in the "Fundamental Beliefs" held by the Seventh-day Adventist Church, believing that they can be adequately supported by the Bible and the Spirit of Prophecy. The same committee, however, finds your manuscript presenting several positions that are at variance with the presently held fundamental doctrines of the church. It would seem to us that you are still challenging the pillars of our faith particularly in the area of the doctrine of the sanctuary and the role of the Spirit of Prophecy. 1. That you are willing to acknowledge that there are several points in your present position on the doctrine of the sanctuary and related areas and the role of Ellen White that are out of harmony with the "Fundamental Beliefs" of the church—as indicated in the attached paper—and that in counsel with your brethren you are prepared to suspend these views in harmony with Spirit of Prophecy counsel and make a public statement to this effect? 2. That from henceforth your teaching and preaching will be in harmony with the "Fundamental Beliefs" of the church as voted in session at Dallas in April, 1980? 3. That because your special views on the sanctuary doctrine and related areas are so widely known you will indicate your willingness to acknowledge publicly that your PUC lecture and recent manuscript do present some areas of doctrine that are out of harmony with the pillars of our faith, and these will be held in abeyance and not discussed unless at some time in the future they might be found compatible with the positions and beliefs of the Seventh-day Adventist Church? 4. That you are prepared to cooperate with the church by pen, voice, and influence to restore confidence in the "Fundamental Beliefs" of the church with a desire to restore unity in Christ and His church? That to this end you will endeavor as a minister of the Seventh-day Adventist Church to do what you can to protect the fundamental beliefs of the church from internal and external attack and develop an atmosphere of unity, of faith, doctrine, and practice? Des, I know you are a man of integrity. There is no desire on my part to force or coerce you to go against your conscience. I believe in religious freedom. However, while you are being supported by the tithe of the Seventh-day Adventist Church, we do not believe it is too much to ask for an indication from you that you will henceforth uphold and teach, preach, and write in harmony with the fundamental beliefs which represent the pillars of our faith. Our great desire is to see you preserved for the ministry. But for us to help you, there must be some cooperation on your part. We earnestly pray that you will be able in all good conscience to find it in your heart to respond to this letter positively. We await your reply with real concern for you, and deep love as your friend and brother in Christ. I deeply appreciate your letter of Au gust 15 and the graciousness with which it softens certain conditions verbally ex pressed by you on August 15. In harmony with that spirit I wish to do all I can in good conscience to support the church I love and for which I have la bored these thirty years. I sincerely regret the sorrow I have brought to many by acceding to the re quest of my fellow teachers at PUC in speaking on the topic of their choice in their Forum of October 27, 1979. 1 realize that both that address and my sanctuary manuscript conflict with our "Fundamental Beliefs" statement on Daniel 8:14 as commonly understood. May I state clearly, however, that I am now, and always have been, in the fullest harmony with the main doctrinal positions of our church set forth in the "Statement of Fundamental Beliefs" as voted in Dallas in April this year. The differences to which you refer relate to accepted sanctuary views in contrast with my sanctuary manuscript and October 27 presentation. Here, indeed, there is a clear divergence of under standing. I appreciate more than words can ex press the tremendous effort the church has made to establish a unity in our understanding of the sanctuary message entrusted to us by God. The Glacier View meetings were marked by earnestness and sweet Christian fellowship. I am greatly encouraged by the consensus statement, "Christ in the Heavenly Sanctuary," and the honest, frank acknowledgments it makes. In harmony with its essence, as I understand it, I can gladly teach and preach such to the same extent as the majority of my fellow teachers present at Glacier View. I take this opportunity to declare that I have pledged myself to seek and to foster, to defend and to preserve that unity in the church for which Christ prayed so earnestly. As I have always sought to recognize the human weaknesses to which I, with all others, am subject, I admit that in the solutions I have offered to our sanctuary problems I could be wrong. I therefore accept the counsel of my brethren and God's messenger (to which counsel I earnestly wish to respond positively) to keep to myself the views that have brought perplexity. As the brethren continue to study, I will refrain from teaching and preaching on the sanctuary in any area that might bring confusion and misunderstanding. I have confidence in the leadership of the church and wish to give my brethren loyal and intelligent support. I greatly appreciate the spirit of openness so manifest at Glacier View and our resolve to continue the study so well begun there. I love this church and wish to see it fulfill the great purpose for which a divine providence brought it into existence. If this letter is used in a public way it should be used in full, or not at all, in order to make two points clear to all. First, I am set for the defense of the body of Christ, and I am willing to do all I can to support it in good conscience and to refrain from causing it any hurt whatsoever. Secondly, I cannot com promise in my understanding of the doctrinal issues. Inasmuch as the Adventist Review has now published to the church and the world acknowledgments of the accuracy of certain key points of my sanctuary MS (see postscript), to with draw such would be to repudiate the consensus statement and bring confusion confounded. May the Lord bless and guide us as we strive unitedly for the blessing of His people. 1. It is the little horn, and not the sins of the saints, which defiles the sanctuary. 2. The cleansing of Daniel 8:14 has to do with restoring the damage done not by the saints but by the little horn. 3. The meaning of the key verb in Daniel 8:14 is not basically "cleanse," but justify, vindicate, restore. 4. There is no obvious verbal link between Daniel 8 and Leviticus 16. 5. The year-day principle is not explicit in Scripture. 6. Hebrews 9 does draw on the Day of Atonement to illustrate that which Christ did by His sacrifice. 7. "Within the veil" applies to the second veil, not the first, and points to access to the Most Holy Place. 8. Hebrews does not teach a two-apartment ministry (or two phases). 9. Christ, not the Father, is the great Judge in the final judgment. 10. We should not speak of our Lord's heavenly ministry in terms of apartments. 11. The N.T. viewed the second ad vent as imminent in its day. 12. Sacrificial blood purifies rather than defiles. There were two items to which I should have made reference in last week's letter—one, my relationship to the Spirit of Prophecy, and the other supposed collusion with those critical of the church. I believe that E. G. White was en trusted with the gift of prophecy, a special messenger to this people. My sanctuary MS 602-641 summarizes this conviction. See particularly from 631 onwards, which is a polemic against those who wish to reject E. G. White. However, from 1887 to the present, our official statements regarding the nature of her inspiration deny inerrancy and I fully agree with my brethren on that matter. As an inspired leader she has and does teach the flock, but never are her writings to be made the sole basis of doctrine. This she affirmed repeatedly, and I gladly concur. On the other matter, neither I nor my wife have any relationship with critics of this church, which would be disloyalty to the body of Christ. Despite accusations, we have never been a channel of "in-house" matters to such. We are well aware that much GC committee material is "leaked" to the outside, but it has not been through us. The limit of my sharing of information with any "outside" has been the statement that the task on which I was working was not a novel one, but one engaged upon by other men well known to us such as W. W. Prescott and L. E. Froom. In view of the materials circulated by Walter Rea on Prescott and certain nontraditional presentations to be found in Froom—such information was hardly top-secret.